My entire 10 months of awaiting Oliver was filled with random happenings. Aside from working full time at Field to Fork and the farmers markets, we packed up our whole house, put 90% of our belongings in storage, and moved to the east coast. Once we were settled in,I had about a month to dilly dally; and find another low key job that would allow me to stay off my feet, to ensure a healthy pregnancy. After finding the two perfect jobs, I finally started to get my nesting on! I feel as though I am a natural nester. I love my home. Since most of our belongings are still in storage I’ve had to turn our bedroom into my little nest. Our space is pretty limited, but we make the most of it. And voila! Cute, soft on your bum, cloth wipes! Here is a link to a tutorial. And whats even better, is my homemade bum spray! My solution is made up of Dr. Bronners unscented baby soap, sunflower oil, lavender, calendula, and camomile oils, along with a couple drops of grapefruit seed extract. Erik and I recently drove back to Wisconsin for Christmas break. On the road, we knew it would be hard to wash our diapers, so we used the Seventh Generation and Naty brand of disposables. We also used an organic disposable wipe. Oliver had a rash by day 2. As soon as we arrived in WI we switched back to our Soft Bums and cloth wipes. The rash disappeared. Side note: Soft Bums are made in the USA. Whoot whoot! My next project stemed from realizing how much paper work comes with a baby! 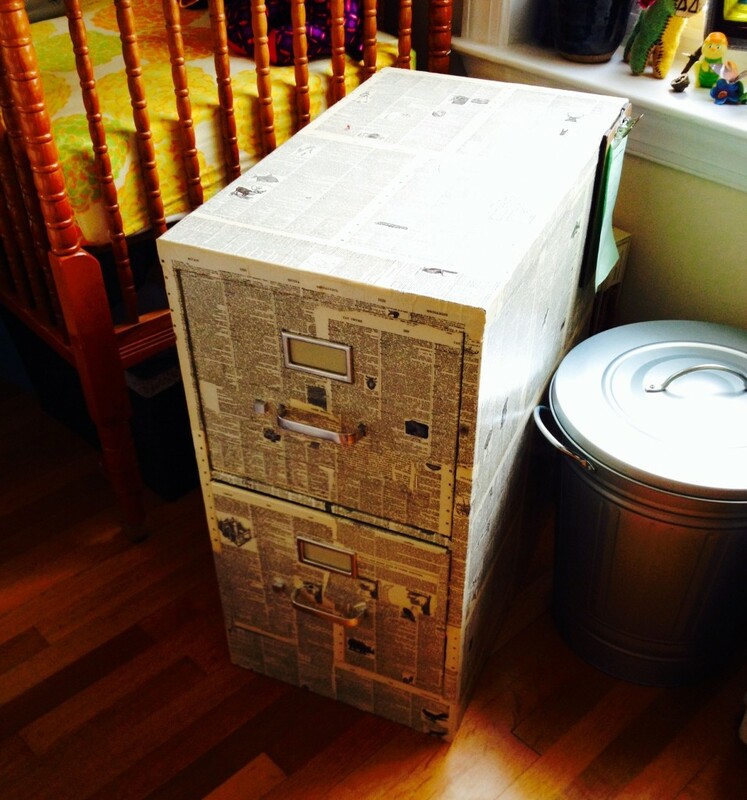 I know we’ve always had papers that needed some organizing, so I decided to bring home a file cabinet from work and modge podge it. My roommate had this great copy of an extremely old dictionary, and that worked perfectly. It turned out awesome. Nice and neutral, and so easy to do. I now feel super organized! The next thing I knew I had to make was a mobile. At the start of fall we had been collecting numerous varieties of leaves. The fall here felt like it only ended at the start of December so we had plenty of time to collect the best of the colors. We dried and flattened them in books, then I laminated them. My original plan was to hang the leaves from some roughed up looking sticks, but my roommate got me on this gods eye kick. 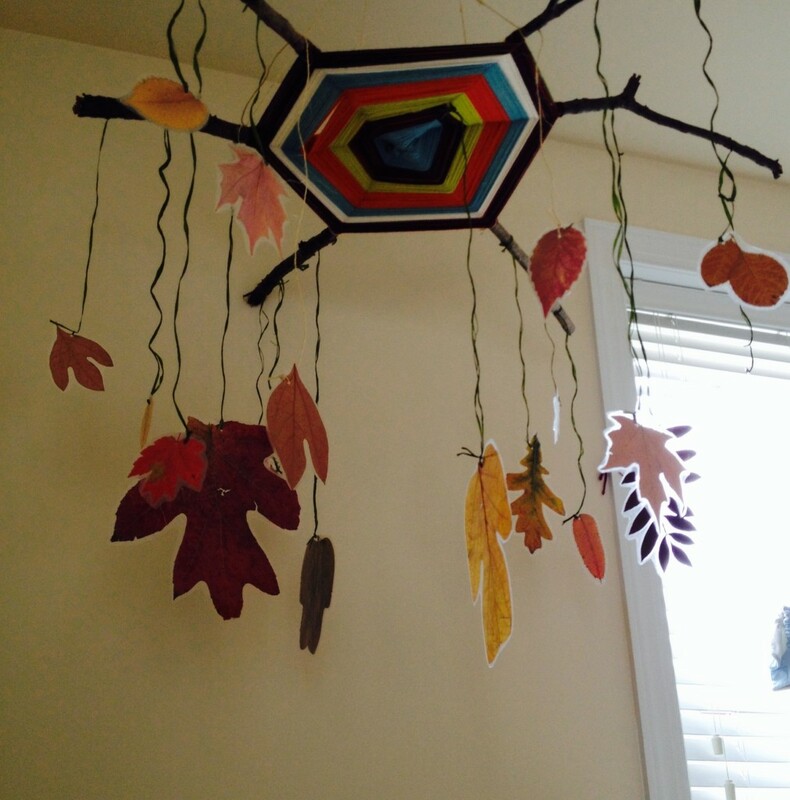 So I decided to make a massive Gods eye using 3 sticks, and then hang the leaves from there. Some of those leaves look pre-historic! I think it turned out awesome! It does seem a little over the top, but as Oliver starts to see lines and patterns more clearly, he loves the reflection the laminate gives when it hits the sunlight from the window. And I love the idea of us capturing the Autumn of his birth. It was such a happy time for us! The last project we accomplished was our onesies. I am so proud of these onesies. I also can’t stress how EASY they we to make. I am still amazed I never thought to try this technique before. I mean Freezer paper?!? I’m not even sure I know how to use freezer paper for its intended purpose. I now have all these crazy ideas for shirts, pillow cases, cloth napkins, a cool pair of high top chucks, you name it! And just think of all the possible gift options! Here is a link to the tutorial as well as the print out templates. She also writes about bleaching techniques which I’ll have to try next. The only sad thing, as I was warned of this, was how quick he’s grown out of them. Erik and I still try to squeeze him into our favorites, but my how time is flying! I sadly already have a box saved for future children, should there be any. 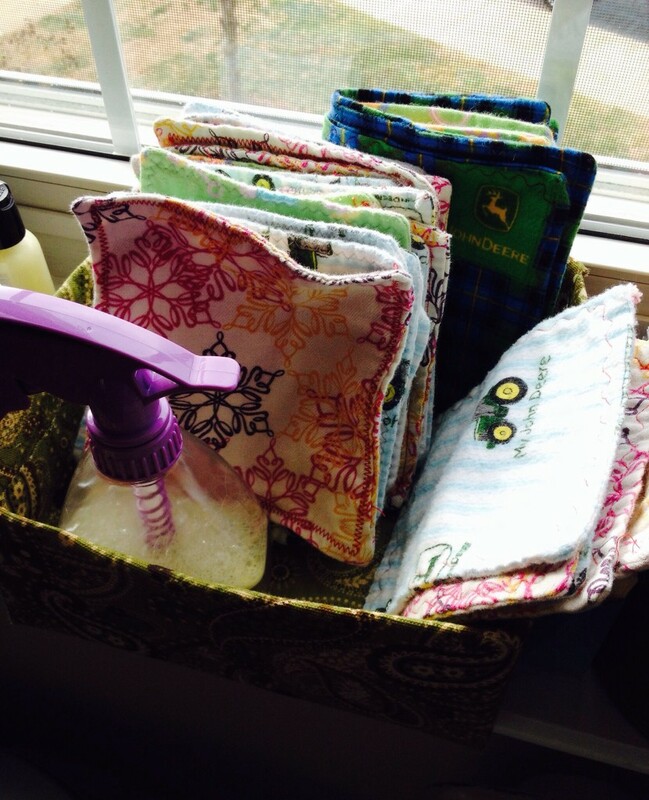 As for the projects I didn’t get to finish: Cloth napkins and Cold pressed soap. I purchased everything to make a camomile bar soap as Christmas presents, then discovered you have to let the soap sit for at least 4 weeks to allow excess water to drain. I knew they wouldn’t be done in time, so I will have to shoot for Valentines presents. When little Ollie arrived of course there was a million more things I wished I had gotten done. But thats a thing of the past. I’m now trying to teach myself to just allow things to go. Who cares if I don’t sweep? Who cares if the laundry sits there another day? The only job I have right now is being a mom to this little nugget we brought into this crazy world. And its the most important job I’ve ever had! 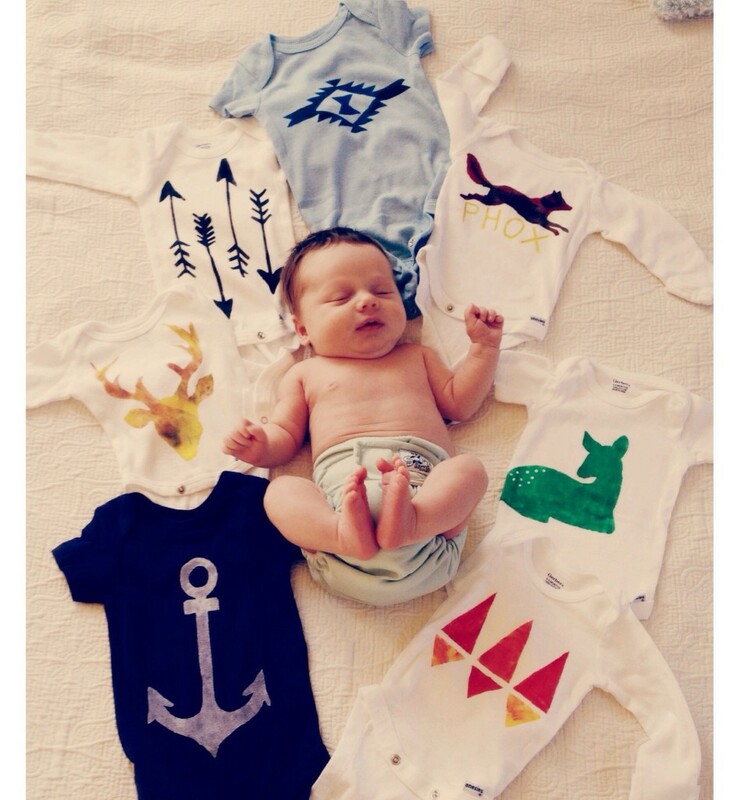 This entry was posted in DIY and tagged Autumn, cloth diaper wipes, DIY, file cabinet, gods eye, mobile, Modge Podge, stensiled onesies, vegpod.